To hear President Trump and Republican lawmakers tell it, their tax reform plan released this week would be a boon for the middle class. In fact, low and middle-income households may see some tax relief, but far less than those at the top of the income scale. That's according to an early analysis by the Urban-Brookings Tax Policy Center, a think tank in Washington. The Tax Policy Center's report, released Friday, found that all income groups on average would get a tax cut next year, meaning they'd have more money after taxes. But the top 1% (those with total incomes over $730,000) would do far better than everyone else. Their after-tax incomes would rise by about $130,000 an average, or 8.5%. The top 0.1%, who make north of $5 million a year, would do even better. Their after-tax income would jump 10%. The bottom 95% of households, by contrast, would get a bump of just 0.5% to 1.2%. That's more money in their pockets to be sure, but not much. Here's a finer breakout of how filers at different income levels could benefit next year. Over the next decade, the good news for the top 1% would continue. Their average tax cut would be even bigger in 2027 than in 2018, though the top 0.1% would get a smaller tax cut 10 years from now than they would next year. Most other income groups also would see less of a tax break by 2027. Some won't get a break at all. Filers with total incomes between $150,000 and $300,000 would actually see their taxes increase by the end of the decade relative to what they pay today. Of course, these are just averages. Even if an income group gets a tax cut on average, that doesn't mean taxes go down for everybody. Next year 12% of filers would have to pay about $1,800 more on average under the provisions of the framework, the Tax Policy Center estimates. That includes about 13.5% of middle income filers, who would pay an average of $1,000 more. And more than a third of those making between $150,000 and $300,000 would pay about $2,880 more on average, primarily because the GOP framework calls for the repeal of most itemized deductions, including the lucrative state and local tax deduction. By 2027, about a quarter of all filers would owe more than they do today, including nearly 30% of those making between $50,000 and $150,000 and 60% of those making between $150,000 and $300,000. The Republican plan released this week is just a framework. The committees on Capitol Hill that will write the tax legislation need to fill in crucial details. So the Tax Policy Center analysis makes a ton of assumptions. But those assumptions are based largely on details laid out in the House Republican leadership's "A Better Way" blueprint from last year and the one-page tax outline released by the Trump administration in April. The Tax Policy Center also made its estimates using conventional methods for "scoring" fiscal proposals. That means it accounts for what economists know about how people respond to changes in tax rules. But it did not yet estimate how the proposals could affect overall economic growth -- using a "dynamic score" analysis. Tax Policy Center researchers said that based on similar proposals, they weren't expecting their dynamic score to show huge growth effects. 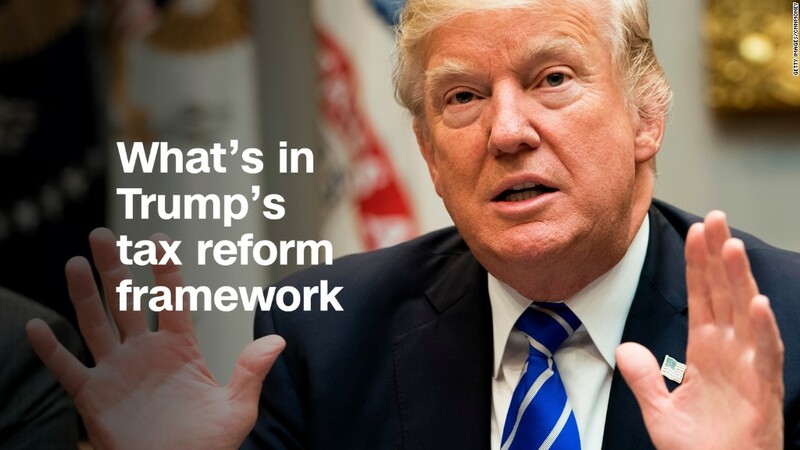 That is likely to put them at odds with the administration, which has said it expects tax reform to help the economy grow by at least 3% on a sustained basis.